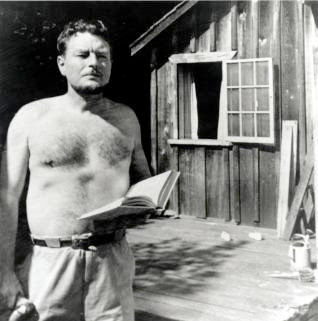 Malcolm Lowry at his Dollarton squatter's shack. On the novel’s second page, the author describes a bus ticket held by the protagonists, who are northbound to Nanaimo aboard the fictional Vancouver Island Limited. The bus climbs mountains, then descends, the movement echoed by the bus engine as gears change, a grinding rhythm providing a soundtrack familiar to all on the island. The author appreciated the shock caused by the unexpected presentation of a spectacular vista. 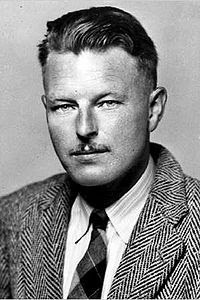 Clarence Malcolm Lowry, the fourth son of a Liverpool cotton broker, was born on 100 years ago this month on July 28. He arrived in British Columbia via Mexico and Los Angeles, a 30-year-old remittance man and dipsomaniac in the process of ending a failed marriage. He moves into a shack on a beach at Dollarton on the North Shore and waits to hear from his agent the response to his latest novel. A dozen publishers read it and all 12 passed. Had he still lived in Mexico, had he not found renewed purposed after marrying the former movie actress Margerie Bonner, had he not considered British Columbia a paradise, finding here the inspiration to persevere in the least romantic of creative chores, rewriting, perhaps Mr. Lowry would have succumbed. Instead, from his squatter’s shack, he worked on revisions, staying with the project even after fire destroyed his home. “Under the Volcano” was finally published in 1947, its creator hailed by some — critical reaction was not universal — as a genius. The academics will visit a display set up by the special collections division at the university’s library, which holds Lowry’s papers. They will be able to see photographs, a Mexican diner menu with pencilled instructions to reproduce it in “Under the Volcano,” and such sentimental objects as his pen. Of particular interest are letters scrawled in Lowry’s crabbed hand. Those missives are only too familar to Sherrill Grace, a UBC professor who edited a definitive collection of two volumes of the letters, even tracking some down as far afield as the Oslo municipal library. “I spent years deciphering his handwriting. It’s horrendous,” she said with a sigh. Lowry saw himself “as the suffering, romantic masculine artist-outcast,” she has written about his early writing career. The correspondence offers a fuller depiction, nit surprising considering the hours he spent in drafting letters. The professor said Mr. Lowry considered himself to be a Canadian and, especially, a British Columbian, finding in this landscape inspiration for his art and motivation to not swig quite so deeply from the bottle. He mistrusted the city, describing Vancouver’s downtown eastside neighbourhoof as “this infernal district” in a poem. He especially enjoyed his beach shack and the Gulf Islands. The writer continues to inspire. Paul Hyde, who had pop hits as lead singer of the Payola$, included a terrific ballad about the writer on his 2002 solo album, “Big Book of Sad Songs.” (The Lowry song was titled, not surprisingly, “Drunken Lover.”) The 1976 National Film Board documentary, “Volcano: An Inquiry into the Life and Death of Malcolm Lowry,” was nominated for an Academy Award, while John Huston’s 1984 film garnered a best actor nomination for Albert Finney as the alcoholic British consul in the Mexican town of Quauhnahuac. In three weeks, artists and social activists will hold their 19th annual Under the Volcano festival at Cates Park in North Vancouver, near the site of his long since destroyed shack. A bronze plaque at the park describes the writer’s 14-year residence on the waterfront, where he rescued from a fire the manuscript that would be his masterpiece. He died just three years later, a suicide by overdose but with enough odd circumstance as to place his wife under suspicion for some. The academics will be making a pilgrimage to the Dollarton shore. Ms. Grace also has a special presentation to make to the archives at the university. Two decades ago she was given a tiny medallion of the Virgin Mary by the American writer David Markson. He had been given the medallion as a keepsake by Lowry himself. Now, it will join the rest of Lowry’s belongings, a gesture the writer likely would have dismissed as sentimental nonsense.